Perfectly roasted, perfectly seasoned. Really, this is a must try. Okay, pretty soon this blog will need to be called “Tiny Chicken Stories” instead of “Kitchen” if I keep getting a chicken at the farmers market every week. But I must admit, I really did outdo myself this time, and it wasn’t even on the time-consuming pepita-cilantro sauce that accompanied the chicken. Sadly, we didn’t even need it, even though it was delicious. I will have to make some (chicken) enchiladas soon and use the sauce then. So what did I do that was so amazing? I’m not sure if it was the spice mixture or the butter. Since I have been responding well to the sheep and goat milk products recently, I found some goat-milk butter at Whole Foods and decided to try it. It has a delicious flavor, not sour at all, as I expected. It also melts quicker too. But it tastes like the smooth, unsalted butter of Europe, and I’m hooked. Last night as I’m cooking the sauce, I decide to take about half a stick of the goat butter and mix in some ground cumin. I went to toast some cumin seeds up to grind them, then found a mixture that I’d already made that had ground cumin, coriander and brown mustard seeds. What the heck? I thought, and mixed in about a teaspoon of it into the butter. Well, dear reader, the recipe follows—for the chicken only. I’ll share the pepita sauce when I make the enchiladas, because trust me, this chicken doesn’t need anything. Use the goat butter if you can find it, but if not, use the best European, unsalted butter you can find, like Plugra. Vegetarians and vegans: this spice mixture (minus the butter) would be awesome as a marinade or seasoning for grilled tofu/seitan or roasted vegetables. I only remembered to take a photo after I'd taken a few bites. Sorry! Put the cumin and coriander in a small, dry frying pan and heat on low until you can start smelling the spices. Stir or shake the pan occasionally, but it should only take about 2 minutes. Once you start smelling the aroma, add the mustard seeds. They will start popping within about 30 seconds, so have your mortar and pestle or spice grinder ready. Grind the spices as fine as possible. Turn the oven to 425 degrees F and oil your roasting tin (a tablespoon or two of oil will do, just enough to coat the pan). Put the tin in the oven to preheat. (Jamie Oliver’s recommendation, and it seemed to work a treat!) Peel the yams and cut into large chunks, at least 1.5″ in size. Wash and dry the chicken; place on a cutting board or plate. 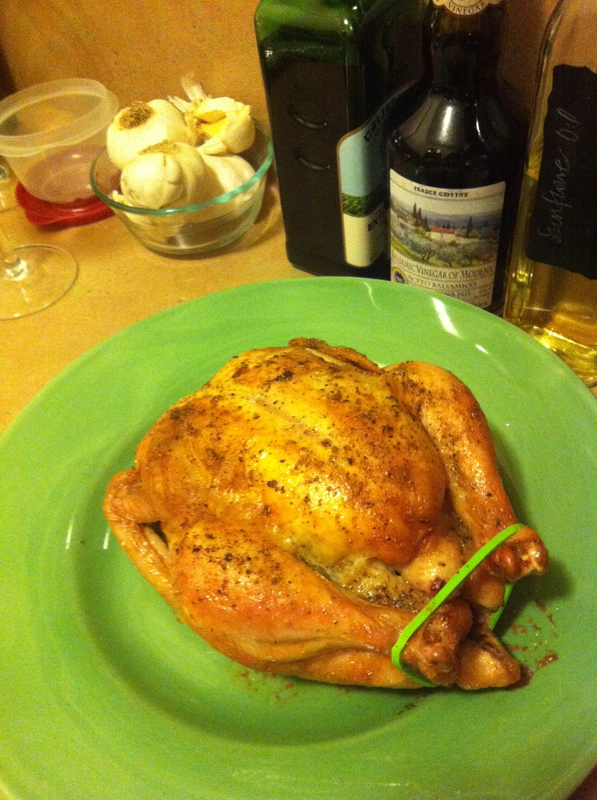 Starting with the underside, rub the bird with the seasoned butter, making sure it gets under all the wings and legs. Flip over and rub the breast side with the butter, and put any remaining butter in the cavity. Take another teaspoon of the spice mixture and sprinkle it over the top, along with some sea salt and some grinds of black pepper. Cut little slits in the skin near the bottom of the breast and tuck in the wing points to keep them close to the bird so they won’t burn. Also, I used one of these new-fangled silicone bands to keep the legs together, which worked perfectly, but you can always use twine. When the oven reaches 425 (and please use an oven thermometer, I never trust what the oven says! ), pull out the roasting tin and carefully add the chicken. Set the timer for 25 minutes and resist the urge to open the oven to check on it. When the buzzer goes off, pull the roasting tin out and remove the chicken while you add the veggies. Stir the veggies so they are covered with oil; make room for the chicken to be set back in the center and plop the bird back in. Get ‘er back in the oven. Set the oven for another 30 minutes (if your chicken is larger, add another few minutes, but I always think that you can always put it in to cook it longer, but once it’s overdone, there’s no going back!) and when it goes off, check the chicken with a meat thermometer. You want it to be at least 165 degrees between the thigh and the leg. It should have a golden, crisp skin by now! Take the chicken out, stir the veggies and put them back in the oven to crisp up a bit. Tent the chicken with foil. When the veggies are done, pull them out. 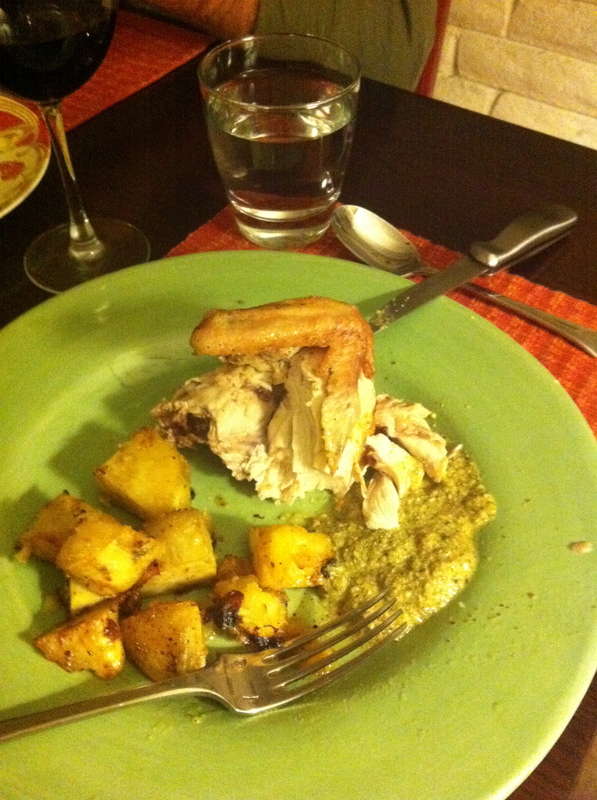 We didn’t carve the chicken, just cut it into fours, which worked perfectly. Served with the yams and a salad, we only had a spoonful of the sauce, of which I will blog about later.